With different colours, lengths, and necklines... lace dresses can be day time subtle or dramatic and vampish. When it comes to lace dresses, my preference is feminine, flattering and sophisticated. Like this Quarter Sleeve Lace Dress with Belt in White (S$39.00, sizes available S- XL) from Grasiva. It is a white lace dress with a straight neckline, 3/4 sleeves, slim cut and comes with a detachable satin waistband. I would wear this to a casual brunch or even a more formal event. There is some stretch to it, making it comfortable to wear. And it is fully lined, so no worries about it being see through. The material is thin enough for it to be airy and perfect for our weather. 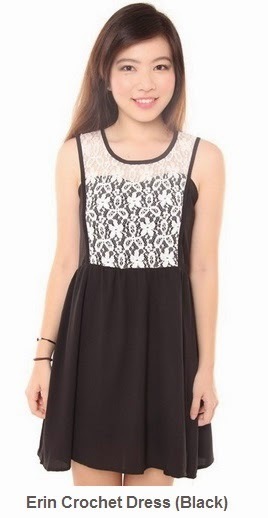 For lace dresses, this is one of my top picks. It is also available in Blue, Black and Powder Peach . If you prefer two tone colours, consider the Floral Lace Shift Dress in Pink. Pink dress with a black lace overlay. For just a touch of lace, go for dresses with lace details, like the Erin Crochet Dress. It has a lace bib like design over a sweetheart neckline, and the rest of the dress is flare and flirty. This type of skater cut is flattering to all figures. Ruffles make a dress picture perfect and stylish. You can incorporate ruffles into you look by having a flounce on the bottom of your dress, a ruffled hem that is fitted at the waist (also called a peplum) or ruffles around the neckline or armhole. The key is subtlety.. you don't want to be a walking ball of ruffles. The select area of ruffle should accentuate your body. Draw attention to your summer legs by opting for a flounce on the bottom of your skirt. The Floral Dress with Ruffle Hem in Blue (S$38.00, Sizes available: S - XL) is a dress which features a trendy ruffled hem skirt in floral print. It's one of my favourites for this season. It's also available in red & pink. This dress is comfortable to wear, the colours on the skirt are vibrant and attractive... and it's balanced out with a solid plain white top. Apart from the pretty ruffle, I also love having dresses which make it seem like I mix and matched and put together an outfit when really it's just one piece. For ruffle around the waist, this Classic Peplum Dress in Mint is feminine dress that is office appropriate too. Love that it comes in a pretty shade of mint. Want to add lace or ruffles or just something to perk up your week to your wardrobe? Click here to check out the latest dresses at Grasiva. Additional DISCOUNT for my Readers. To welcome you as a new customer, register at http://www.grasiva.com and get S$2 off your 1st purchase. 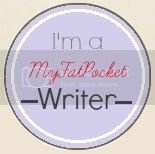 On top of that $2 off, they're now offering additional 5% to Holly Jean's readers. Use code: Holly5OFF upon checkout. Discount code is valid till 31st May 2014.